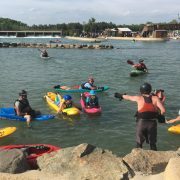 Bellyak 101: Mastering the Basics! This blog lesson will focus on the very foundation of proper bellyaking: Proper body position and posture, forward and combination strokes, and learning to trust your secondary stability. In the picture below, Jamie is demonstrating the proper posture for paddling: head up and engaging the core to form a powerful prone position. Many people ask…what about my face?? As you can see, there is quite a bit of bow in front of you, and your head position is far enough above the water to easily see where you are going and what is coming up ahead. Proper Trim is when you are centered on the Bellyak, neither too far forward or too far back. We see a lot of first timers get too far forward on the Bellyak. This makes it very difficult to control, as you will just go in circles. Too far Forward: Stern is too far out of water. Too Far Back for Paddling…this is the position for surfing river waves. We often see folks paddling too far back on the Bellyak who think that you have to kick…remember the Bellyak is ‘front wheel drive’ and made to glide through the water, therefore proper trim is crucial. 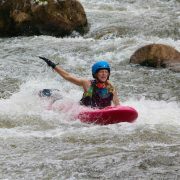 *In the more advanced skills, surfing river waves requires the rider shift their weight towards the back of the bellyak to be in a position as shown in the picture above. This will raise the bow and make it easier to surf. 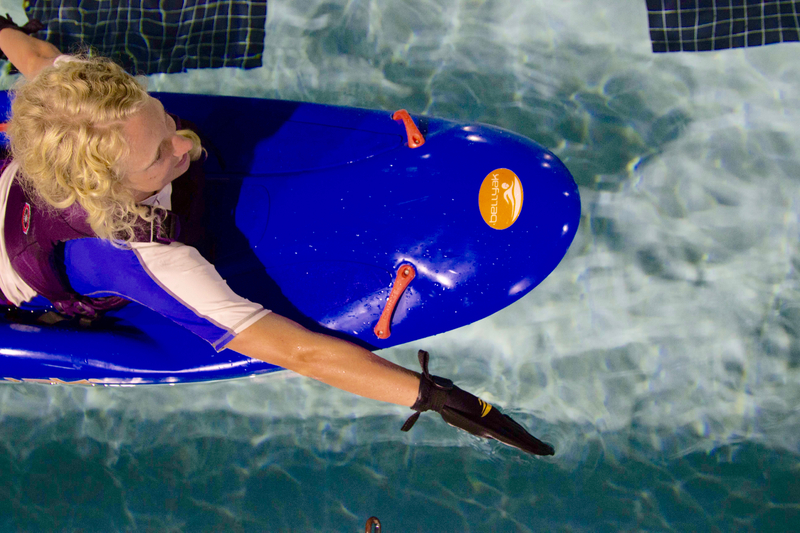 For general paddling, the neutral position, centered in the boat, is most effective. 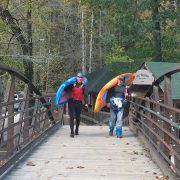 *The handles are used to reposition and are not for hanging on while going downstream. 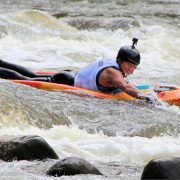 The Forward stroke is the main driver for the Bellyak. The majority of the time you will be using an alternating, thumb down sweep stroke. Imagine if you were doing the breast stroke, and alternating arms. 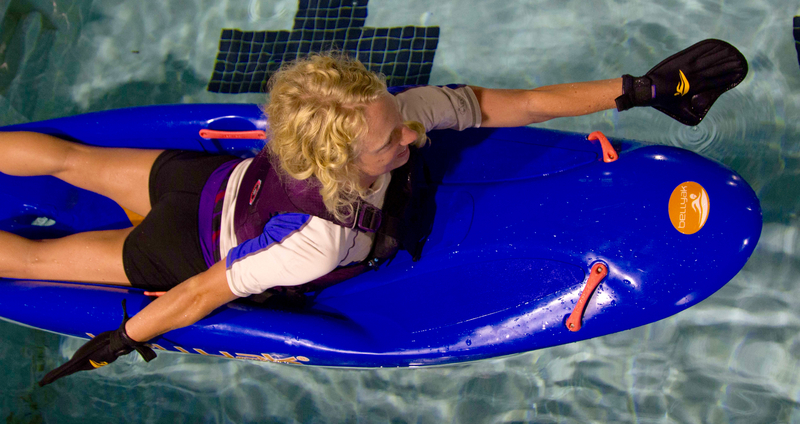 It’s more effective to paddle this way, as it reduces shoulder fatigue over doing a deeper, more crawl style stroke. 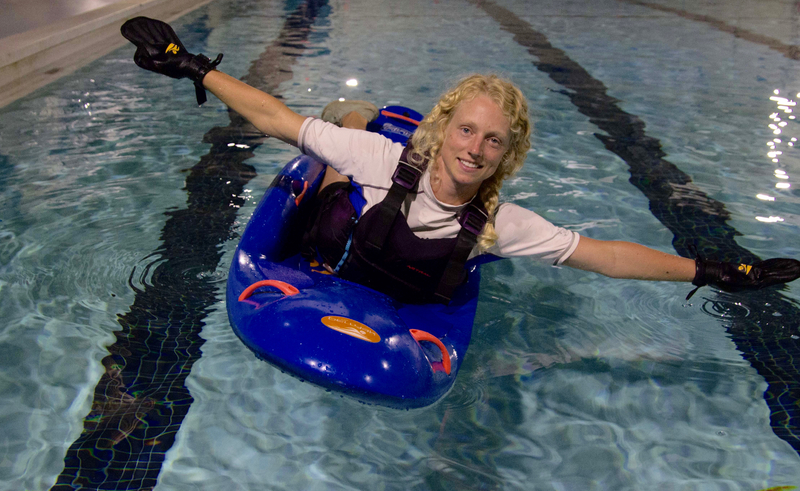 The unique thing about not having a paddle is that you can use two hands in the water at any given time, allowing maximum mobility. Most of the time you’ll be using a combination of strokes while paddling your bellyak. The most common one to practice is spinning in place using a combination of a forward stroke on one side and a reverse stroke on the other. 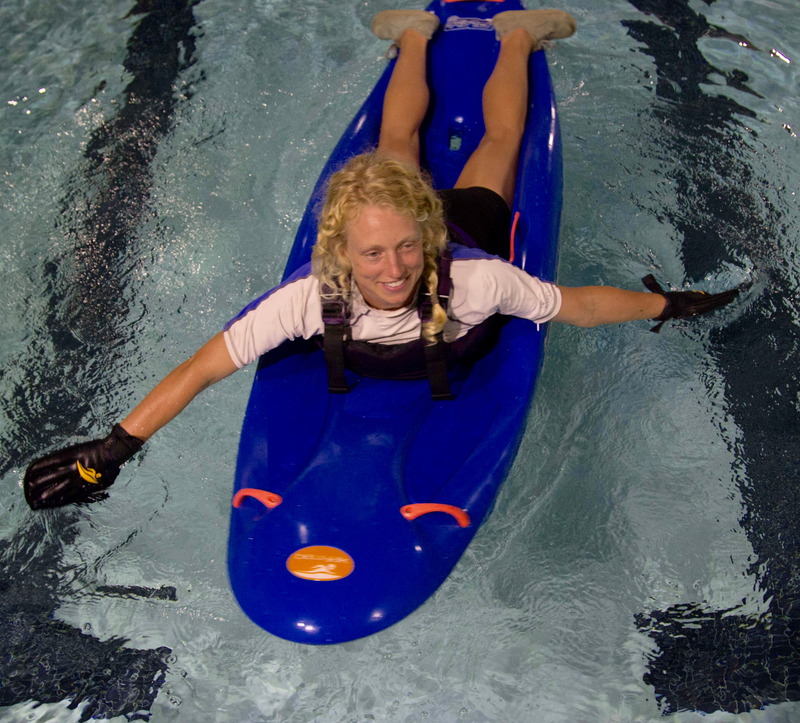 The bellyak was designed to have excellent secondary stability. What does that mean? It means when you lean left or right the boat will support you ‘on edge.’ This is a crucial skill for moving water, as your success will depend on how well you can ‘edge’ your boat in current. Now that you have the basic body position, the forward and combination strokes along with right/left lean you can start adding in rudder strokes to help keep you on course as you move forward. 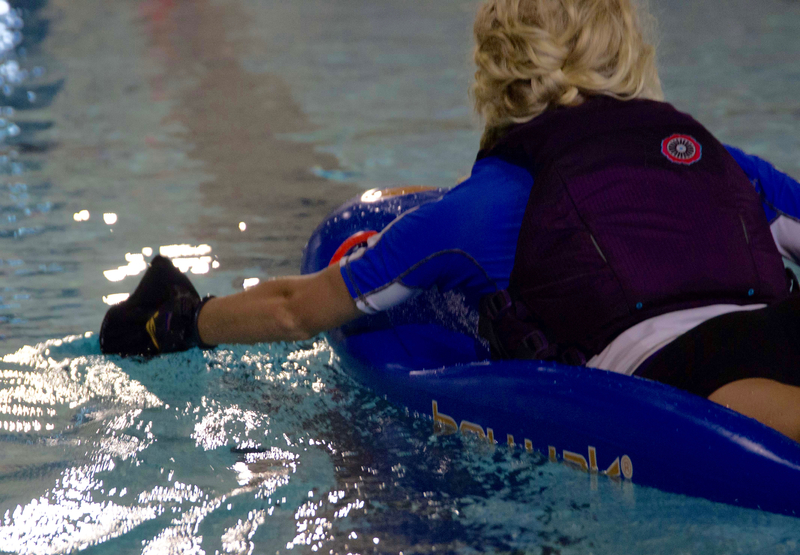 As you are moving forward, if the bellyak starts to drift off course, you can use your opposite hand to help it correct back to center. You place your hand forward just as if you were reaching to do a forward stroke but instead of being ‘thumb down’ it will be ‘thumb up’ as the picture shows. Practice this in flat water by generating some speed and as the boat glides practice combining the lean you learned above with a static rudder. Always LOOK where you WANT to GO, not at what you want to avoid. True for life as well. 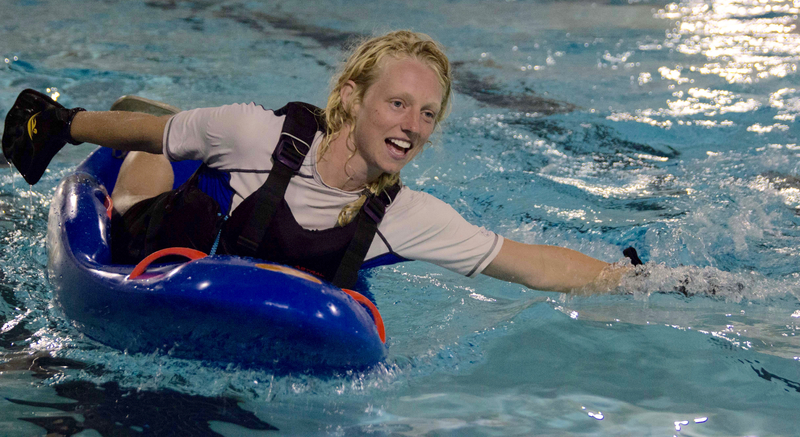 Is there a skill you would like to learn that you’ve seen us do on the Bellyak? Send us a message and we’ll create a blog to answer your questions! 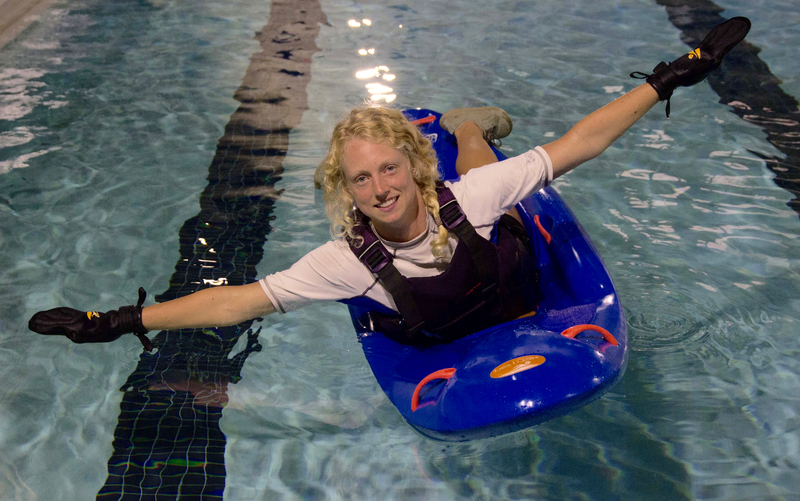 Thank you to the American Canoe Association for providing the photos and supporting the development of the prone paddling curriculum. If you are not a member of the ACA, join today!